Buying a toy for a toddler can be tough. Choking hazards must be taken into consideration and durability is definitely a necessity. Younger children can be very rough, especially on their toys. A toddler is typically considered to be between 1 and 4 years of age. In this age group, they are developing motor skills and often needs larger toys to hold on to easily. They haven’t quite developed those fine motor skills yet that would allow them to play with smaller toys and tiny objects. If you’re in the market for a nice dollhouse but are not sure what the best option would be for a small child, you’ve come to the right place. Here are some options for dollhouses for toddlers. Both are great choices while the kids are still at risk of choking on small parts. Both these dollhouses are great introductory playhouses, with the VTech being more gender friendly. Both are noisy and fun – every toddler’s dream. 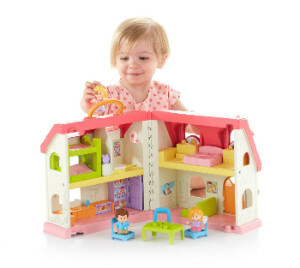 Little ones experience joy in learning with the Fisher-Price Surprise and Sounds Dollhouse. New discoveries are just a few finger touches away when your toddler discovers one of the ideal first toddler dollhouses, the Fisher-Price Little People Surprise and Sounds Home. Toddlers quickly find out that they are in control of all the fun features, phrases and songs that make this toy so enchanting. Adorable Little People figures capture their imaginations as they pretend their way through life scenarios. Lots of fun sounds, songs and phrases to bring it to life! 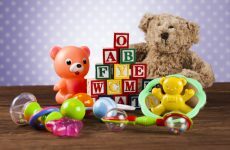 Parents have noticed when their child plays with the Little People Surprise and Sounds dollhouse that they’ve begun to make connections between things that go in in the dollhouse and things that go on in their own homes. These fun discovering keep this dollhouse endlessly enchanting. Best suited for 1-5 year olds, and a toy that they will enjoy playing with for years to come! This interactive discovery home comes with a little character called Miss Norah who talks and interacts at various points in the home. These are called MagicPoints and there are seven on this particular home. This home features sounds, songs and tons of interactive play for the imaginative child. Miss Norah also works with other Go! Go! sets along with other characters that are sold separately. The VTech Go! Go! 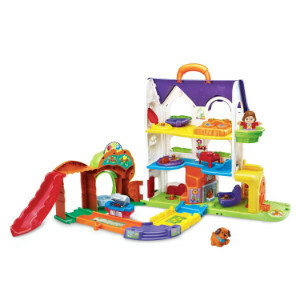 Smart Friends Busy Sounds Discovery Home requires 2 AAA batteries and is intended for ages 1 to 5 years. It measures about 11.8 x 19.3 x 16.9 inches. The VTech Smart Friends Busy Sounds Discovery Home is for parents that might want their child to experience a more digital style dollhouse. Unfortunately, you must have at least two characters to use the MagicChat feature that allows the characters to talk to one another. The pet dog, a grill and four track pieces are all included with the toy house. This is a really fun dollhouse for toddlers that will keep your child busy for a good long time. It’s fairly inexpensive and would be a fun piece to add onto. Both are sturdy and bright and will keep the little ones entertained for hours. 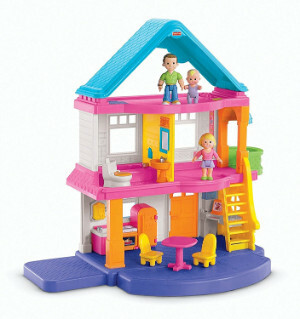 The Fisher-Price Mу First Dollhouse is one of the best dollhouses for 2-5 year olds and the most popular starter doll house on the market today. The My First Dollhouse has 5 wide open rooms, very bright colors and is made of strong plastic to take the beatings of a younger child. the large figures are easy to hold and arrange – perfect for little hands. The combination of bright colors, big rooms and easy to use figures and accessories make it easy for younger children to get started while still keeping older children engaged as well. The set includes 3 large figures, Mother, Father and baby. Also included are a fridge, stove and sink, a table with two chairs, and a toilet with a seat that lifts up. Product dimensions: 8.5 x 15 x 21 inches. The Fisher-Price Dollhouse really is one of, if not the best dollhouse, for 2-5 year olds out there. In fact, it seems to be a permanent fixture on the Amazon bestseller list. Kids of all ages love to play with it and it is built to last a life-time. The bright colors and easy to use figures make it perfect for little hands while still attracting older children as well. The bright pink Minnie Mouse Sweet Home is a fun little dollhouse for your toddler. 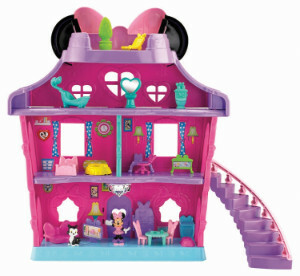 There are four floors to play on and it comes with Minnie and Figaro characters as well as 18 accessories to place around the house. This dollhouse is interactive as well with lights and phrases that Minnie says. This play set is recommended for ages 2-5 years and requires three AA batteries to get the disco ball going and to hear Minnie talk. It measures about 5 x 24 x 15 inches. This adorable Minnie Mouse toddler dollhouse will give your child hours of imaginative fun. One of the biggest problems with this set is that the staircase doesn’t stay attached, especially if you move the house. Other than this, it seems to quite a favorite among toddlers who love Minnie Mouse. This age group are spoilt for choice with the larger, more life-like frames, and endless choices of dolls , doll house furniture, and accessories to go with them. Guaranteed years of fun and entertainment. The KidKraft Majestic Mansion Dollhouse is over four feet wide and four-and-a-half feet tall and is the best suited dollhouse for 3-7 year olds, giving young kids tons of space for taking care of their favorite dolls. This adorable dollhouse is full of fun, interactive features and would make the perfect gift for any occasion. If you’re looking for an extra large dollhouse which comes with a range of dollhouse furniture then the amazingly impressive majestical grand mansion will be perfect for you and your little ones. 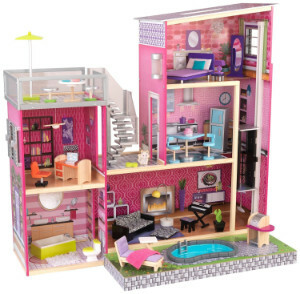 The mesmerizing size, details and quality of this stunning classic design will provide hours of fun at playtime, and the cool features and accessories truly make it one of the best dollhouse sets around for girls who just love Barbie size dolls (up to 12 inches). 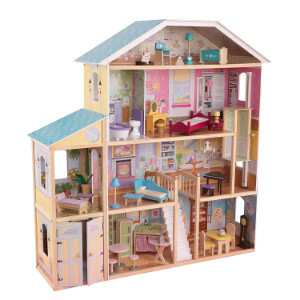 This inspiring wooden dollhouse features an open fronted design for easy access and a quality 33 pieces of dollhouse furniture and accessories, the eight rooms, staircase and gliding lift add an extra fun dimension to play time for any child and their favorite dolls. Product dimensions: 52 x 14 x 53.5 inches. In addition to the general pieces of modern furniture adorning the main rooms, there is also an elevator between two of the floors and a cute little resident kitten. The older kids will love the little details. This KidKraft Majestic Mansion dollhouse is best for 3-7 year olds as it has smaller parts which are a choking hazard for the younger toddlers. There is so much going on with this Majestic Mansion that is actually quite impressive to adults as well as children. Your daughter (or son!) is sure to spend countless hours with their friends marveling at all the parts, the rooms towering above their heads, and the different stories they can devise with about their dolls lives now that they have moved up in the world. ‘Smart’ accessories snap into an interactive furniture piece for lights, sounds and/or motion – for instance, try the aquarium to watch the fish swim and hear bubble sounds. Flip open the ‘flat screen’ in the living room to insert your own smartphone and play videos for Barbie doll (sold separately). Built in garage door opens and closes by sliding a tab. Flip atrium window down to convert to a swimming pool. The Barbie Dreamhouse is best suited for 3-10 year olds. The small parts are a choking hazard for children under 3 years old. It includes tech that recognizes ‘smart’ accessories which activate different lights, sounds and motions throughout the house. Barbie dolls are not included. Product dimensions: 8 x 30 x 34 inches. Easier to assemble than any previous Barbie Dreamhouse, this year’s offering is a hit with Barbie lovers of all ages. Special favorites are the new interactive features with lights and sounds that contribute to the realism of the play experience. Just imagine inserting your smartphone into the T.V. slot and queuing up a movie to enjoy with Barbie and her friends! This dollhouse invites children to use their imaginations in creating a variety of role-plays. Note that all dolls, pets and cars are not included, but are sold separately. The latest Barbie Doll House recently released has all the bells and whistles and is the most technologically advanced on the market today. The Barbie Hello Dreamhouse Review can be read here. This beautiful classic KidKraft dollhouse is best suited for 3-15 year olds and is sure be to every girls dream dollhouse! Decorated like a classic mansion, it will no doubt provide hours of fun and imaginative play for the kids. It is large enough to accommodate multiple children playing with it at once. It comes with 35 pieces of beautifully crafted and colorful furniture and is jam-packed with fun details. With some parts being small, it is recommended for ages 3 years and above. This colorful and hip doll house creates a great space for young children to play with and accommodates Barbie dolls up to 30cm high. 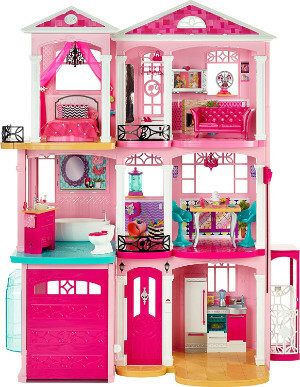 The Uptown Dollhouse includes over 35 pieces of furniture and accessories. Garage with swinging doors that open and close, and an elevator that glides back and forth between the second and third floor. This wooden dollhouse comes with enough furniture to fill the 8 rooms set over 4 levels. Manufactured in true KidKraft style with non-toxic paints, and made of wood, MDF, fabric and yarn. Product dimensions: 46.2 x 25.1 x 61 inches. This super stylish wooden dollhouse comes with 35+ accessory pieces and is true luxury. A great doll house for 3-15 year olds. Standing almost 4 feet tall, the Disney Frozen Ice Castle Dollhouse is a marvel to behold. Your kids will love putting the Princess Elsa figurine, or any Barbie doll or that matter, in this beautiful dollhouse. It features 11 highly detailed pieces of furniture including a chandelier, grand piano, and a gorgeous ice throne. The dollhouse is made of mostly high-grade composite wood materials, and some safe molded plastic. 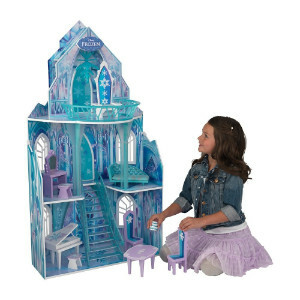 This new dollhouse by KidKraft is a Disney Frozen fan’s dream come true, accommodates Barbie dolls and other fashion dolls up to 12 inches, and is best suited for 3-15 year olds. If you are already familiar with other KidKraft play-sets, it is the same type of sturdy wood material, and you screw it together with actual screws and a screwdriver. Product dimensions: 24.1 x 16.5 x 45.4 inches. While it doesn’t come with dolls, it features 9 rooms, 2 bonus play rooms and 3 light-up accessories. If you are looking for a hot holiday toy for your Disney fan, THIS IS IT! Sure, you have to have room for this house that is over 3 feet tall, but to hear the squeals of little girls across the country come Christmas morning, it might just be worth it! When purchasing a dollhouse for the first time there are definitely some things to consider. This post goes through a few of them in detail. 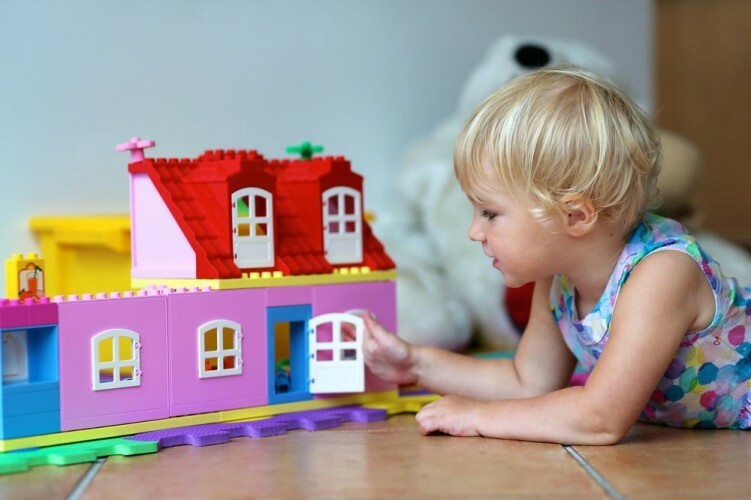 We hope this overview of the most popular dollhouses for toddlers, right through to pre-teens, has been helpful in assisting you on your search for the best dollhouse for your family.